Unique ready reference for all complementary medicine, massage therapy and manual therapy practitioners and students alerting them to 'red flag' symptoms which should be referred for Western medical investigation or emergency medical treatment. When can a patient be safely reassured and when do they need further investigation or treatment? 'Red flags' are clinical signs that suggest a patient needs prompt investigation and treatment for a potentially dangerous situation. Therapists increasingly find themselves working alongside conventionally trained doctors and nurses and it is vital for them to understand conventional medical diagnoses, symptoms and treatments and, crucially, to recognise warning signs of serious disease. This is essential in order to be a safe practitioner. 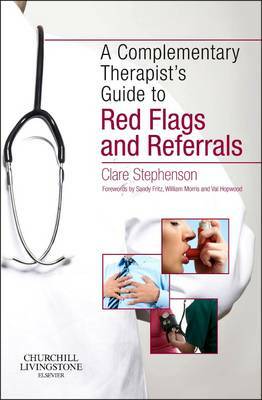 Clare Stephenson's 'The Complementary Therapist's Guide to Red Flags and Referrals' meets this need by providing an easily accessible reference to 'red flag' symptoms, designed especially for therapists. It offers guidance on how best to respond to those symptoms and signs of disease which can be readily discerned through routine history taking and basic examination of the body. The guidance is in language which is accessible to therapists, and clear advice is offered on when to refer patients to conventional medicine practitioners and how to communicate with doctors when making a referral. Clinical syndromes which merit rapid response are summarised for ease of reference.